Chris Shea is president/CEO and owner of Low Country Machinery in Georgia. 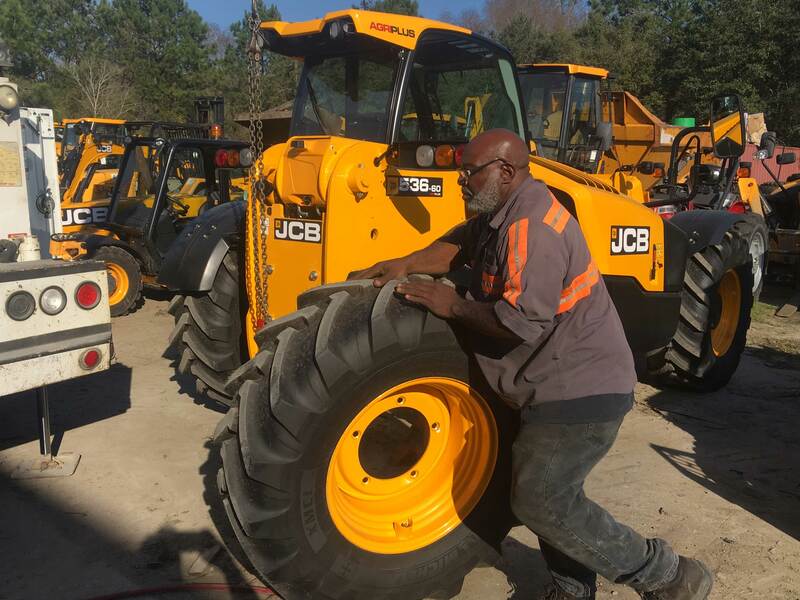 Chris Shea, 38, president/CEO and owner of Low Country Machinery, a JCB dealer in Pooler, Georgia, parlayed a job behind the parts counter into his own dealership, growing it steadily. Years later, after graduating from Georgia Southern with a business degree, Shea knew he wanted to sell construction equipment or tractors. Shea is a member of the Under 40 in Construction Equipment, Class of 2017. This is another in a series of profiles highlighting some of the past winners. He walked into what was then JCB of Georgia cold, seeking a job. Shea was hired for the parts department in 2004, and he loved it. “I was there for about six weeks and a position came open in the sales department, and when I came into the sales department, I sold my first machine on my first day,” he says. Enter or nominate for the 2019 Dealer Excellence Awards here. Shea brought on the Massey Ferguson tractor line, Scag mowing equipment, and grew Low Country’s rental and sales fleets. He also bought a Kubota dealership in Statesboro, Georgia. He saw every piece as a progression for his dealership and his customers. “Being a single-brand dealership where all we had was JCB, we didn’t have a walk-in business where people just walked in off the street; you had to go get that business,” Shea says. “The landscaper today, at one time he was the person who was mowing the grass in his early 20s, and he didn’t have much more than a pickup truck,” Shea says. “So we brought on the mowers, and we have a lot of landscapers who come in and buy lawnmowers from us,” he says. “Well, those landscapers, in a year or two, they’re going to be buying skid steers and mini excavators. If they’re coming to us already to buy those Scags, you know that they’re already comfortable with us and we have that relationship,” Shea says. The results have been spectacular. In 2016, when Shea took over, Low Country did $9 million in sales. In 2018 when he closed the books, the dealership did $28 million. “It’s a little bit of investment and surrounding yourself with good people,” Shea says. Now Shea is concentrating on selling extra services to his customers in the form of telematics, maintenance contracts, and extended warranties. It can be a step-by-step process. The first thing he usually has to introduce is telematics. Shea is selling maintenance contracts to about 60 percent of his customers. The customer told Shea he’d like to try financing through his local bank. “A couple of days later, we get a phone call from him. He said, ‘Hey, I’m sitting in my bank, can you fax over a sales order on the machine so they can process the deal?’ It happens all the time,” Shea says. The next afternoon, the salesman delivered the machine to the customer’s house, and did the walk-around in front of the customer and all his employees. “Four or five days go by, and we get a phone call from the bank—the check bounced,” Shea says. “We called the bank back and they said the check didn’t bounce, it’s no good. The check’s stolen. So it was a scam from the get-go. At the time, I didn’t know that the 48 mini excavators came standard with LiveLink telematics, because [JCB] had not made the announcement yet,” Shea says. One of the ways Shea put the word out about the stolen excavator was through Facebook. A JCB employee in the U.K. saw Shea’s post, over a weekend. “I saw a message that said ‘Call me.’ It had a telephone number, but I didn’t know who it was,” Shea says. When Shea called the number, the JCB employee, who worked at one of the company’s plants, told him he had the machine located. The employee had accessed the computer system on the excavator, disabled it, and put “pings” on the machine where it was located. Telematics also features into the maintenance contracts Shea finds his dealership selling more of. “We’re wanting to grow it, but right now we’re probably selling maintenance contracts to 60 percent of the customers buying from us,” Shea says. “It’s one of those things where people are buying PM contracts, and extended warranties now where they wouldn’t buy extended warranties before. These are things in the last two or three years that we’ve seen a big movement towards. “It’s because of the job market,” he says. “Just like us, it’s hard for people to find mechanics. Kids today don’t want to go to school to learn to be a mechanic; they want to go to school to learn to sit behind a desk. Mechanics are the biggest problem we have. It’s the biggest problem everybody has. And downtime is what costs these customers money. In the past, they’ve always had a mechanic on staff. Now they can’t get that person. The technician shortage is causing an increase in the sales of PM contracts and extended warranties. Leasing is also on the come, according to Shea. “It’s crazy how this business has evolved,” he says. “When I first started selling in 2004, until probably 2012, I hardly leased a machine. I mean you couldn’t convince people to lease a machine. And now, everybody wants to lease. They want a machine for three or four years. They want you to do the service contracts, and they want full warranty, and in three or four years, they want another brand new machine, because they don’t want the headache of dealing with the Tier 4 problems. It’s the certainty and convenience that customers like, Shea says. And he’s big on maintaining relationships. Low Country Machinery serves a roughly 75-mile area around Savannah, but Shea is considering expansion with a location in Charleston, South Carolina. Shea will likely do it. One step at a time.